UPDATE, below. Stunning new insights from Salinger’s thesis. Here is further explanation of why the Coalition put together an application for a judicial examination of the national temperature record. NIWA has recently provided a web page on how it combined the temperature records from weather stations at Albert Park and Mangere, to produce the ʻAucklandʼ component of the Instituteʼs Seven-station Series (7SS). This page displays a simple but fundamental flaw in NIWAʼs methodology. The Albert Park weather station was established in 1909, when both the region and the park were young. 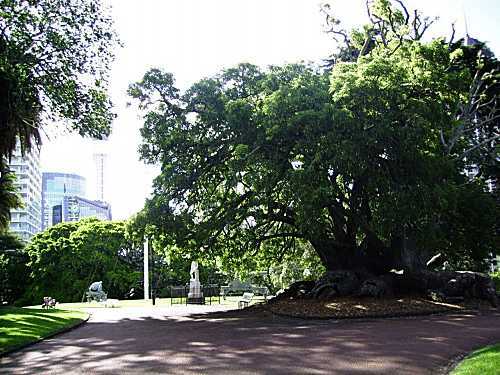 But, as the population grew and the saplings became large trees, the site became progressively less suitable for measuring the temperatures of greater Auckland. Concerns long expressed by the NZ MetService were finally met in 1976 by a transfer to Mangere, then on the outskirts of the City. when the shelter effect was much less. Part of Albert Park now, showing the maturity of the splendid trees and the proximity of the large modern city. The park is lovely to walk in — it’s very sheltered. Click for larger version. Here is a major conundrum. There are no other weather stations north of Masterton which have continuous temperature records running back to the early part of the century. It would seriously strain credibility if the Auckland record is simply jettisoned. That would mean most of the North Island would be unrepresented in the official New Zealand temperature record for the twentieth century (the Seven-station Series). So could the most serious flaws in the Albert Park series be somehow “corrected”, to make the record usable? Well, thatʼs a strong statement – “cannot be satisfactorily resolved” – but surely we can do something! That would be better than simply jettisoning the whole series. If we assume a break-point in 1940, and note that the 1941-76 mean daily range was 0.42°C higher that 1910-40 (as a result of sheltering and urbanisation), then we could subtract that figure from the former period. That’s pretty crude, of course, as the problems were getting progressively worse over the period, and they probably started back around 1920. But it’s a start, and some clever statistical analysis could surely sharpen it up. The Auckland site is covered in a “Schedule of Adjustments” NIWA published last February, which expressly talks about urban warming (footnote 3) as the reason for the transfer from Albert Park to Mangere. It is astonishing, then, that NIWA seems to entirely ignore the impacts of the shelter and urban warming problems that brought about Albert Parkʼs demise. Theyʼve done nothing at all to redress the progressive false warming signal embedded in decades of Albert Park records – but have harnessed that false signal to buttress their claims of warming throughout New Zealand! 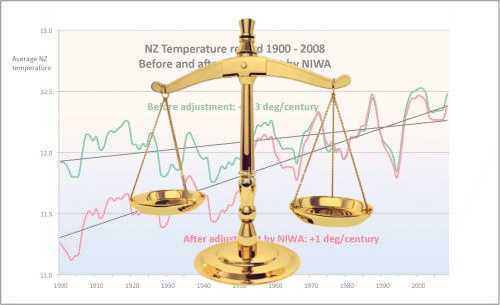 Because NIWA made no attempt to offset the gradual deterioration of the site, and carried the downward adjustment of -0.6°C all the way back to 1909, the full impact of the false warming signal has been put to use. How does that work, you ask? Because the earlier temperatures were lowered, there’s now an upward trend — simple! And then NIWA added icing to the cake. Hessell’s paper highlighted that the 1950 screen change caused an artificial jump of 0.4°C in the Albert Park record. Therefore, to compare the periods on either side of this change it was necessary to ADD 0.4°C to the pre-1950 records (or subtract 0.4°C post-1950). He sets out a Table with the 1945-50 readings and shows that they all jumped about 0.5° in 1950-55 after the new screen was fitted. As a result of using the wrong sign for their 1950 adjustment, NIWA were able to portray the first half of the century as being 0.9°C cooler than the MetService records (including Hessell) actually showed. Along with the uncorrected false warming signal created by Albert Parkʼs urbanisation/shelter “heat island”, the Auckland series made a major contribution to the alleged 1.0°C warming in the Seven-station Series. Were these two bloopers in the Albert Park record just unfortunate errors? Itʼs truly amazing that every station in the official New Zealand temperature record seems to contain unfortunate errors — and quite incredible that they all bias the record in the same direction. Every station in error; all errors point to global warming! Incredible. The problem with this roseate view is that Hessell went to to the trouble of applying sophisticated statistical tests to detect the presence of a trend bias. He found ‘a highly significant result’ that there was only a 0.5% likelihood that the observed warming trend was due to actual climatic effect. He found that the trees were still growing, and that sheltering was much less in the years preceding 1940. If Salinger’s “see no evil” approach was justified, then why was it necessary to close down the station and move it to Mangere? He seems unaware that this happened in 1976. Salinger appears to agree that the 1950 screen change had a heating effect, requiring an UPWARD adjustment to pre-1950 temperatures. So it was obviously not the thesis which inspired NIWA to adjust the readings in the wrong direction. But rather than the +0.4° which Hessell calculated from on-site studies, Salinger derived a figure by before-and-after comparisons with a host of other unrelated stations, viz: Whenuapai, Tauranga, Wellington, Te Aroha, Oratia and Waihi. He came up with +0.1°C, but nobody knows how, as his worksheets have been lost. The NIWA “Schedule of Adjustments” sets out three substantial early-year reductions in the Auckland record, being -0.4° pre-1868, -0.5° pre-1950 and 0.6° pre-1975. None of these are supported by the Salinger thesis — which tends to suggest that NIWA used some other source, as yet undisclosed. There are very good reasons for declining to follow Salinger’s methodology. It is startling in its stark simplicity — being based on the crude and untested belief that the temperature anomaly of any New Zealand station should equate to the simple unweighted average of the anomalies at any other New Zealand stations which were operating at that time. No preference is given to proximity, or climate zones, or stations with well-correlated temperature patterns. A coastal station 300 metres away gets the same weighting as a mountain station 300 kilometres distant. In fairness to Dr Salinger, he was a pioneer in this field of replacing missing or suspect temperature data by notional data inferred from other sites. In 1980, there was no international literature on the subject, nobody else was doing it, and there was clearly much room for improvement in his initial techniques. This is highlighted by the vastly more sophisticated framework proposed in the Rhoades & Salinger paper published some 12 years later. But thirty years have now passed. There have been extensive peer-reviewed writings on techniques which might allow data to be legitimately inferred from neighbouring stations, and much better statistical tests to check probability intervals. Why has NIWA not taken advantage of these twenty-first century methods? As a result of urbanisation and sheltering, the Albert Park weather station (1909-76) suffered from progressive ‘heat island’ effects. This accounted for warming in excess of 0.4°C during 1940-70, and probably a similar amount during 1910-30. The NIWA adjustment of -0.5°C to 1868-1950 readings went in the wrong direction. It wrongly assumed that the old screen was over-reading temperatures. When these errors are corrected, there was no material warming trend in Auckland during the last 100 years. The NIWA Schedule of Adjustments does not reflect the adjustments suggested in the Salinger thesis – and no other source has been disclosed. The Salinger thesis (and the NIWA figures) directly contradicts the contemporaneous Hessell paper. Salinger’s figures are speculative and said to be based on comparisons with distant stations (although the worksheets are lost), whilst Hessell’s figures are based on statistical analysis of the Albert Park station, which can readily be replicated. So, get out there and publish your paper so that your ideas can be evaluated, Bill? If you had any confidence in your claims you would, wouldn’t you? Not laziness is it? His ideas are here; they couldn’t be plainer — evaluate them. Heavens Ken, you sound very antagonistic. Speaking as an academic, it seems to me that Barry is providing a valuable service for NIWA. While none of us likes to be proved wrong, we should be keen to see work reviewed and errors pointed out so that they can be corrected. Certainly the apparent error in the sign of the screen-change adjustment in 1950 seems to be a real issue. Barry has either made an error in his analysis or NIWA has. It would be very simple for NIWA to either explain why Barry is wrong or to correct the temperature series; providing a better product and increasing trust in NIWA’s work. Unfortunately Barry has not provided a link to the page in question so it’s very hard to investigate his claims. There appear to be some old paper-based Met Service records that haven’t made their way onto the CliFlo site. From time to time NIWA have had to go back to these and correct CliFlo. An example is the Hokitika Township vs. Southside sites, where they were joined together in CliFlo as one station, but when NIWA checked the old paper records, they found them to be two separate stations, and they had to correct the database. The same happened at Thorndon, where 29 “missing” overlap days were discovered. Dr Hessell would of course have had full access to all these records, and his analysis would in fact have been more accurate than NIWA’s now, because there would have been no confusion as to what was digitised and what wasn’t – it was all paper-based, and all of it was accessible. Google discloses that a pdf copy of the Hessell 1980 paper may be found at http://tinyurl.com/2djeu26. The Albert Park screen-change effect is set out in Table 2 on page 4. Huub it is hardly antagonistic to encourage someone to make their evidence available in the normal manner. As an academic you will know this is not via a blog or via legal action. It is not via a report claiming mischievously that adjustments are not necessary and accusing our scientists of misconduct – fraud. If he has something of value it is best presented in the correct venues – conferences, peer reviewed publications, etc. With the history of this organisation, (don’t forget their slanderous report has been thoroughly discredited) it’s hardly surprising that he can’t get any scientific ear. And of course he doesn’t want one. This organization exists to attack the science, to distort and discredit the science. And to libel our honest scientists. it is political – not scientific. And it is blatantly dishonest. Once again, Ken, you’re missing the point. 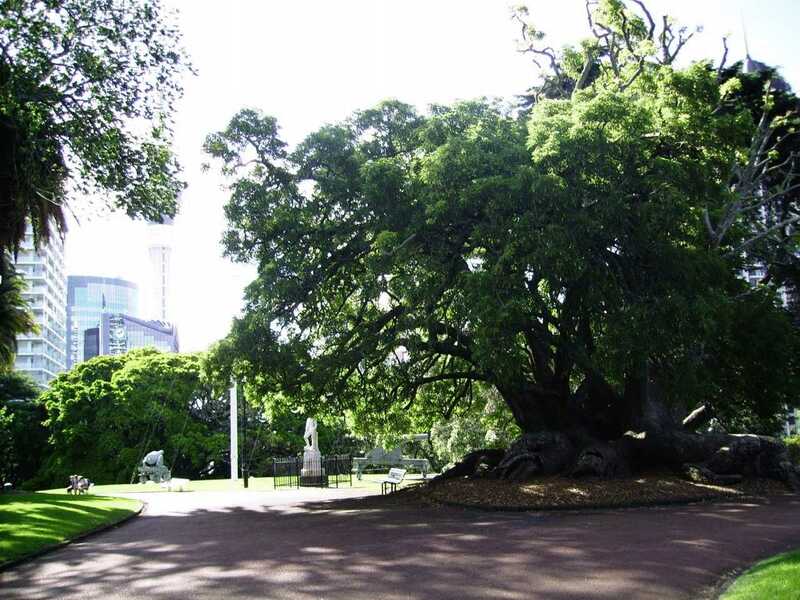 The peer-reviewed literature shows that Auckland Albert Park has experienced significant non-climatic warming due to urbanisation effects and instrument changes. It concludes there is negligible climatic warming at the site. That, like it or not, is the current state of play. The NIWA graph on the other hand was not peer-reviewed, has no calculation methodology to back it up, and yet claims a significant climatic warming. Which carries more weight: a peer-reviewed paper in the NZ Journal of Science, written by a senior member of the Climate section of the Met Service, or an unsubstantiated set of unreproducible calculations based on a student thesis, that hasn’t gone through a journal peer-review process? No contest, I suggest. There is no reason to produce a paper, there is nothing to refute. The current paper stands. The outlier is the NIWA graph. It must be removed. Bizarrely, you’ve ended up defending anti-science. An enjoyable analysis, that, Bob! Very nicely put Bob. I enjoyed that also. This site should get linked on WUWT. Both blogs have a great way of cutting to the issue and explaining it well. And allowing contrary views a polite hearing with reasoned debate. Not like the scorn and ridicule you get on Hot Topic and Open Parachute. They censor as well. Is it just me or has anyone else noticed how shrill and desperate Ken seems to be these days. Look at the striking contrast of posts between him and Bob. I asked Anthony Watts (again) not long ago to include Climate Conversation but to date I can’t see a response; he probably gets that sort of request all the time. But it might be a good idea for you to send him your request, just as you’ve worded it here — it’s candid and genuine and might get his attention. We support other sceptics and would be pleased to see our name on their sites. Thanks. Pingback: Climate Conversation Group » Temperature adjustments science or art?